Marcos on the first day of the summer program 2013 in the West Side program. Tuesday was my 14th time experiencing the excitement and anticipation of the first day of Youth Farm’s summer program. It never has gotten old for me. Over the years, much has changed and developed – – new farm sites and and new neighborhoods, cooking and mass food distribution, even a different jobs – – but that first day has always had a unique and special feeling that is hard to put into words, until I saw Marcos yesterday at the West Side Youth Farm. As Executive Director, one of the great privileges that I have is being able to take a day like Tuesday, the first day of our summer program, and visit/experience/soak up all that is Youth Farm. I met new Youth Farmers in Frogtown, walked through the huge farmsite at St. Olaf Church Campus in Hawthorne, and shared some unbelievably good (youth made) Macaroni and Cheese and salad (from our farms) for lunch with youth in Lyndale. But my most special moment was early in the morning on the West Side. As a 15 year West Side resident and founding Program Director of the West Side neighborhood program, it is always special to go there, as it feels like home. No one is more enthusiastic about Youth Farm on the West Side than Marcos. While he has been around the West Side program for a number of years, he lives and goes to school in Virginia during the school year, so only comes to the West Side during the summer. Some may remember Marcos as the “Compost King” from the Compost Cup presentation video a few years ago. When he talks about Youth Farm, Marcos dances with excitement, literally. He is now 15 years old, too old to be a Youth Farmer or All Star, and since he is not here during the school year, he is not a Project LEAD staff. 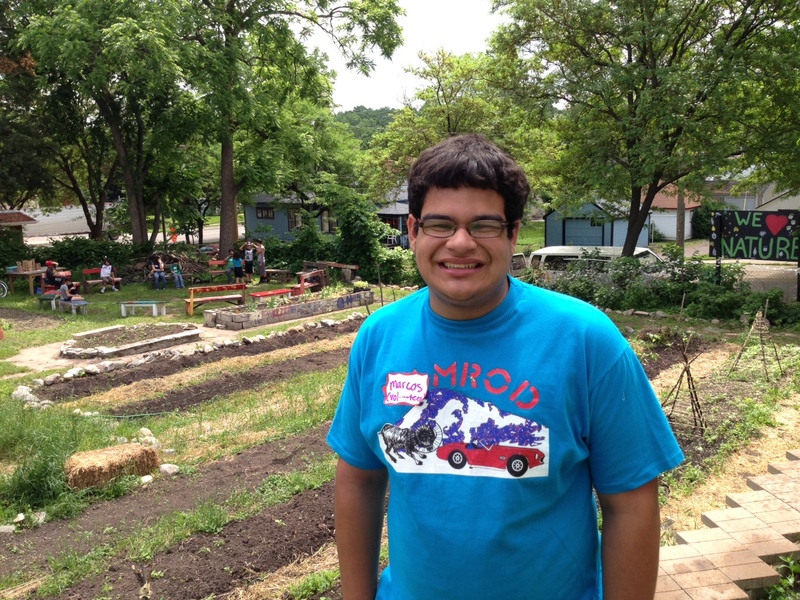 That has not stopped the West Side staff from finding a role for Marcos as he will be taking on a leadership role as a volunteer every day this summer, and he could not be happier about it. And that’s why I love working and being a part of Youth Farm everyday for the past 14 years, because like Marcos, Youth Farm is my family too, and always will be for both of us. Teng Lee liked this on Facebook. Well said Mr Liden, well said. thanks for taking the time to share this meaningful story. And have you tried the donuts he makes? Thanks Gunnar-it is an amazing thing. Yesterday was my nephew’s first day on the West Side as a farmer! Nick Cobbett liked this on Facebook. J Roger Dierkhising liked this on Facebook. Thanks Gunnar! Marcos, you are a treasure here on the West Side. I remember your donuts from AATN! Wish you were here year round to lead and share your experiences with the younger ones. Keep it up! Lazer Goese liked this on Facebook. Claudine Bennett liked this on Facebook. Sharon Peterson Hendrix liked this on Facebook. Naomi Gamble Zupfer liked this on Facebook.